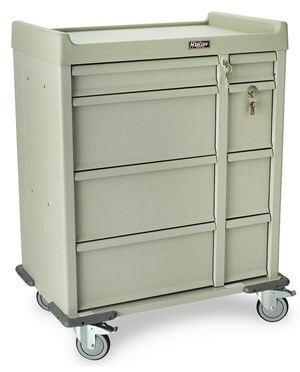 The Harloff Standard Line Dual Column 480 Punch Card Medication Cart is a medical storage device made for ease of use and provides top of the line security to enhance any hospital or examination room. 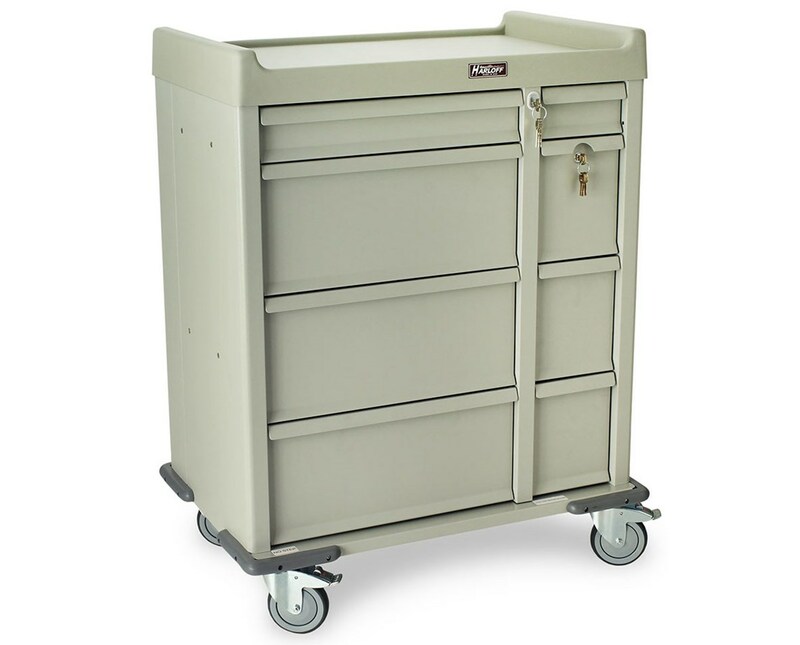 With its steel construction, the Cart features a painted steel pull-out shelf, 8 aluminum drawers, and a locking narcotics & liquid storage section that is separated from the rest of the cart for easy access. The aluminum drawers are mounted on ball-bearing, full extension slides with a left column configuration of one - 4" multipurpose drawer and three - 9.75" punch card drawers (480 Card Capacity) and a right column configuration of one - 4" multipurpose drawer, one- 9.75" locking narcotics and two - 9.75" multipurpose drawers. Because of this, the cart is perfect for a variety of situations and work environments. Mounted on 5" premium ball-bearing rubber casters with two toe-locking brake and one directional, the Cart, with an integrated push handles, can easily be moved around the facility. Number and Size of Drawers Left: (1) 4", (3) 9.75"; Right: (1) 4", (3) 9.75"